Unfortunately, soon after Varela is driving golf balls, a man approaches Varela’s golf cart and unzips the pocket holding the watch in the golf bag. By the certainty the perpetrator had in retrieving the watch, Varela claims that he was stalked. 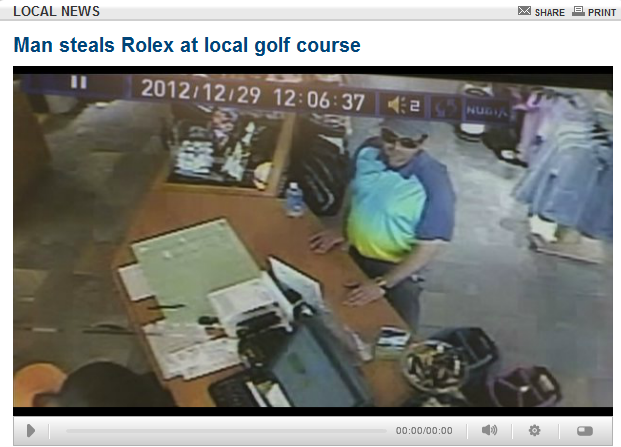 The surveillance video shows the perpetrator in the pro golf shop wandering the store. The video certainly dressed the part wearing golf clothing and golf hat. Golf shop employees report that they have never seen the perpetrator before and after taking the watch, quickly left the premises. This story goes to show that the safest place for your Rolex is on your wrist, even in golfing. Despite the debate whether a Rolex is tough enough for golf swings, if you are in doubt, put your Rolex in your pocket. Better yet, put your Rolex into one of these pouches sold on Beckertime, and then in your pocket.